(Central Islip, N.Y., Feb. 28, 2019) – The Long Island Ducks today announced the team’s “Opening Night of Ticket Sales” will return to Bethpage Ballpark on Friday, March 22nd, at 5:00 p.m. This marks the second consecutive season the Ducks will host the evening event in the Duck Club restaurant. Individual game tickets for the 20th Anniversary Season, presented by Good Samaritan Hospital Medical Center, will officially go on sale at 6:00 p.m. This year’s event will give fans their first opportunity to meet new Ducks Manager Wally Backman. The 1986 World Series champion, who was hired as the sixth skipper in team history last November, will be on hand to greet fans and sign autographs. 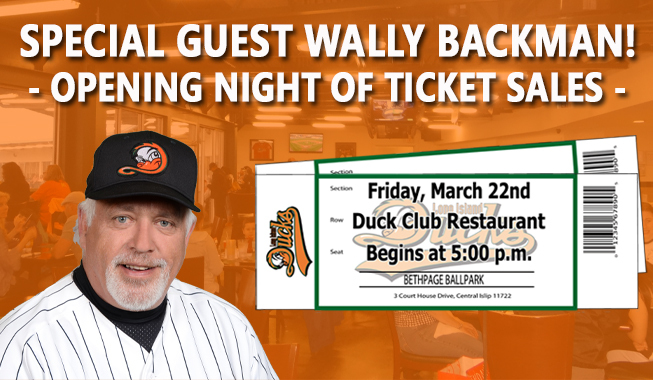 Those purchasing Ducks game tickets on March 22nd, along with those who have already secured 2019 ticket plans, will receive a photo and autograph opportunity with Wally at the event (one photo/autograph per person). Individual game tickets for the 2019 season will go on sale beginning at 6:00 p.m. Prior to that time, fans will be able to enjoy the climate-controlled atmosphere of the Duck Club as well as complimentary light snacks and discounted beverages from partners including Nathan's (Ducks Official Hot Dog Provider), Martin's Rolls (Ducks Official Roll Provider), Herr's Chips (Ducks Official Chip Provider), Philly Pretzel (Ducks Official Pretzel Provider), Pepsi (Ducks Official Soft Drink Provider) and Duck Donuts. The team will also host a special Q&A session featuring Backman and Ducks outfielder/hitting coach Lew Ford, which is slated to begin at 5:30. Nine-time Best Long Island Mascot, QuackerJack, will also be on hand for autograph and photo opportunities with Ducks fans. The event will be emceed by The Wiseman and Big Mike from Connoisseur Media. This event will be the first opportunity for fans to purchase individual game tickets to all 2019 Ducks home games. Fans will be able to purchase their tickets and have them printed in the Duck Club that evening. Ticket prices for the 2019 season are as follows: Box Seats - $13, Field Box Seats - $14, Club Seats - $15. However, those securing tickets on March 22nd will enjoy the same great prices that were in place during the 2018 season (Box Seats - $12, Field Box Seats- $13, Club Seats - $15). The preliminary promotional schedule for the 20th Anniversary Season has been announced, and it can be viewed by CLICKING HERE. Fans wishing to secure tickets in advance of the Opening Night of Ticket Sales are encouraged to contact the Ducks ticket office today at (631) 940-3825 to find out how to become a season ticket or mini plan holder.